Lawmakers prevent PPP's Syed Rafiullah from charging at a PTI member. Members of the ruling Pakistan Tehreek-i-Insaf (PTI) and the PPP on Monday exchanged hot words and nearly got into a physical altercation after the opposition criticised the agreement reached between the government and religiopolitical groups, who protested the acquittal of Asia Bibi for three days last week. The fracas began after PPP MNA Shazia Marri termed the deal finalised between the government and protesters as a "surrender document", and in a taunting reference to Prime Minister Imran Khan's surname (Niazi), compared the agreement to the surrender document signed by Gen A.A.K. Niazi that led to the creation of Bangladesh in 1971. Minister of State for Parliamentary Affairs Ali Muhammad Khan objected to Marri's remarks and asked her to desist from ridiculing an entire clan or tribe for an individual's act. He said it was true that Gen Niazi had surrendered before Indian troops in 1971 but there are other Niazis who are "rendering great services and sacrifices for the nation". Speaker Asad Qaiser interjected with a warning that no member would ridicule any tribe or clan in their speeches in the future. However, when Marri insisted she was actually mentioning the name of Gen Niazi and that she would continue to do so, a number of treasury backbenchers stood up and lodged a noisy protest to prevent the PPP lawmaker from continuing her speech. Meanwhile, a PPP MNA from Karachi, Syed Rafiullah, and PTI's MNA from Layyah Abdul Majeed Khan exchanged some hot words. Getting angry over some remarks uttered by Khan, which could not be heard in the galleries due to noise, Rafiullah was seen charging towards the PTI MNA, but he was physically stopped by a number of lawmakers. The speaker called the sergeants-at-arms to expel both members from the house. However, after failing to control the situation, he adjourned the sitting till Tuesday morning. Earlier, Federal Minister for Religious Affairs Noorul Haq Qadri defended the government's act of entering into a deal with Tehreek-i-Labbaik Pakistan (TLP) leaders for ending their protest sit-ins over the Supreme Court verdict in Asia Bibi case. Speaking during the session, the minister, who was a signatory to the agreement, said the government had not used force to disperse the protesters as per the desire of the opposition parties. He said Prime Minister Khan was constantly in touch with them from China and had also instructed them to resolve the matter peacefully. He recalled that the previous government of the PML-N had also signed a deal with the same protesters (during the Faizabad sit-in), but it was signed after three weeks and after its law minister resigned. In contrast, he said, the PTI government had succeeded in reaching an agreement in three days and without any resignation. Qadri stressed that the PTI-led government "will always defend Section 295-C of blasphemy laws". He said the speech of Prime Minister Khan about the establishment of writ of the state in the country was a policy and it would be implemented during its five-year tenure. "There is a need to formulate a long-term strategy to avoid such a situation [in the future]," the minister said. Former prime minister Shahid Khaqan Abbasi had earlier demanded that some government minister should brief the House about the agreement signed by the government with the protesters. He alleged that the government had a non-serious attitude towards important national issues. Abbasi claimed the government had itself pointed out a lack of quorum on Friday and "ran away from the parliament". Rana Sanaullah, another PML-N leader, said the government had handled the protest in a non-serious manner. Without naming TLP leaders, he said these religiopolitical leaders had all of a sudden entered the political arena even though "none of them had contested even the municipality election before". He said these people were brought into politics during the by-election in NA-120, when Kulsoom Nawaz was contesting the polls, and they were later allowed to field candidates from all constituencies in the July 25 elections. When some PTI members interrupted and asked him to identify the forces who allegedly backed the religiopolitical groups, Sanaullah said they were the same elements "who brought people from south Punjab to Banigala and into the PTI fold". He said the agreement signed with religious groups during the PML-N government's tenure had been "forced" on them and they had not done so willingly. Sannaullah said the opposition had suggested not to use force only at three places — Faizabad in Islamabad, The Mall in Lahore, and in Karachi — as protesters had gathered at these places in large numbers. He said the prime minister in his speech had categorically stated that the writ of the state would be established at all costs, but in the next three days the nation saw no state or government. "After the prime minister's speech, the government took a U-turn and entered into a deal with the protesters," the PML-N leader said. Sanaullah also asked the government to disclose the whereabouts of Asia Bibi. "Has Asia Bibi been released as per the SC order or is she still in jail as per the agreement [with protesters]?" he asked. He said the government had started registering cases against the protesters and there was a fear that innocent people could also be picked up in the drive. 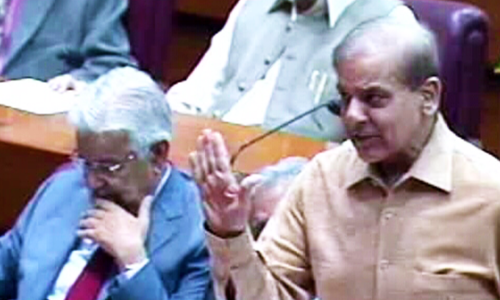 Earlier in the evening, Leader of the Opposition Shahbaz Sharif told PML-N lawmakers that the opposition had "not tried to take political advantage" during the crisis-like situation that had resulted from religious groups' countrywide protests against the acquittal of Asia Bibi last week. 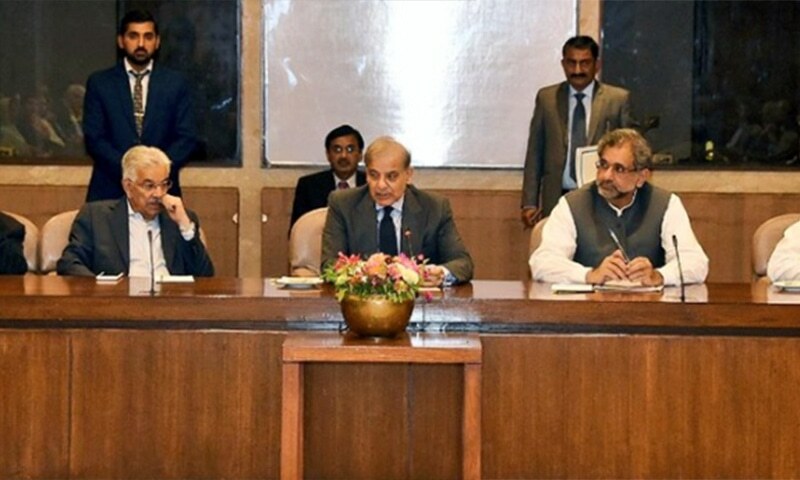 Sharif, who is currently in the custody of the National Accountability Bureau (NAB), was chairing a meeting of PML-N's parliamentary party at the Parliament House. The PML-N president deferred his address to the National Assembly today and is now expected to address the House tomorrow. According to a series of tweets by the PML-N, Sharif during the meeting briefed party members on the steps that helped in improving the law and order situation in the country during the past few days. "[Sharif] briefed party members on the positive role played by the opposition during recent sit-ins," the party said in a tweet. He claimed that although the Pakistan Tehreek-i-Insaf (PTI) had exploited occasions like these for "political gains", the current opposition prioritised national interest instead of doing politics on the issue. 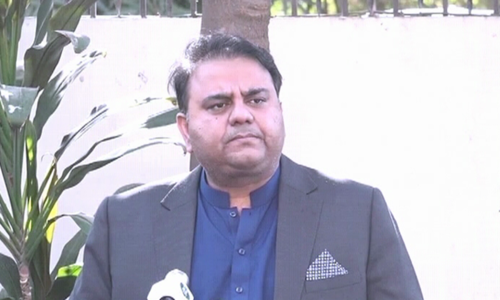 The PML-N president was also quoted as saying that the PTI government had gained nothing from Prime Minister Imran Khan's visit to China this week. In a statement issued, PML-N spokesperson Marriyum Aurangzeb said the meeting had taken stock of the overall political, economic and internal security situation of the country and deliberated upon a strategy for the future. The PML-N members also criticised as an "unparliamentary act" the adjournment of the session on Friday after a lawmaker pointed out lack of quorum five minutes after it started. "The way the government ended the session in such a sensitive situation by pointing out the [lack of] quorum shows the government lacks the ability and courage to deal with challenges," the statement read. 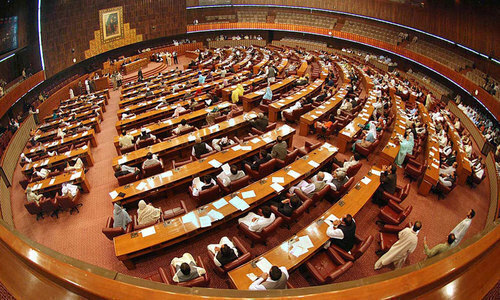 The adjournment of Friday's NA session considerably irked the opposition, which had already expressed its disappointment a day earlier over Prime Minister Khan's absence from the Lower House at a time when the country was facing nationwide protests by religious groups. The meeting expressed concerns over the state of the economy, saying the government has "no economic vision or strategy" to deal with the crisis-like situation. "The increasing economic instability and uncertainty could have... serious implications for the national security," the party said. "Economic, agricultural, commercial and industrial activities are witnessing gradual decline which could become the harbinger of an economic disaster." It was decided during the meeting that the PML-N will issue a fact sheet on the PTI government's performance of first 100 days and "inform the people about the details of the current government's failures". The meeting also condemned complaints and reports of media censorship in the country, saying: "The PML-N considers freedom of press an essential pre-requisite to strengthen democracy." Ahead of Monday's session that began at 5pm, a NAB team brought Shahbaz to Parliament House, where he held a meeting with former NA speaker Ayaz Sadiq, PML-N's Sindh representative Shah Muhammad Shah and MNA Kheal Das regarding matters related to the party's reorganisation across the country. 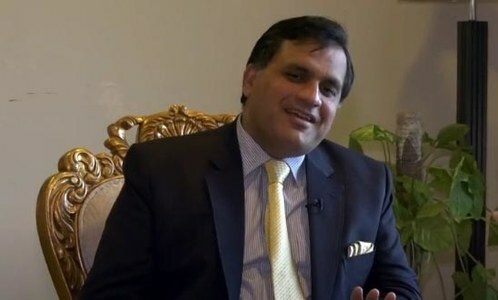 According to PML-N party sources, Sharif also met his lawyer Amjad Pervaiz with his team during which the ongoing NAB cases against him were discussed. The PML-N president, whose physical remand is to end day after tomorrow, consulted his lawyer about their future strategy. As usual, NA will be used to wash dirty linen and shred crocodile's tears to divert attention from real corruption cases - this is what Shabaz Sharif will do. Of course he wants to address NAB cases and not the rioting in the streets. Pakistan is all about him and his family, not our families. is he under NAB arrest?if he is,,how he chaired the meetings? Good decision Shabaz. Punjab is missing you! Every time if our PM goes to visit a country that doesn’t mean to gain something. These visits enhance interactions and relationships. After China has seen how our PML-N has stolen money they are being careful to extend assistance again. Previous governments have eroded our respect internationally. Well you tried and failed.....thanks to smart move by government ! Yes, indeed, and well-appreciated by the Govt. too. However, Khursheed Shah tried to malign the Govt. but I think he was immediately asked to remain silent by Zardari. We'll not be surprised if you took the advantage. Its your nature to exploit any situation. Opposition is more mature than ruling party. The opposition should be commended for this. ...And everyone in PML-N is honest, Sharif and credible?? Then what was that, you guys refused to cooperate with the Government of PTI, chose to go against the State of Pakistan, what a useless statement is from N League. this is the real "tabdeeli". if it was PTI, they would have conveniently endorsed the actions of protesters, like they did last year in faiz abad sit in. Ss is an opportunist I would say. Look who's talking about economy! Is the PML-N trying to insinuate that they are acting responsibly because the country matters to them? Shahbaz Sharif and his parties vision has always been motorways and buses, so when he and his party see PTI working on eliminating corruption, trying to figure out a way to over come the financial mess PML-N and PPP left behind, its considered not having any vision? Mr Shahbaz Sharif, its abundantly clear to the people of Pakistan how you and your brother manage to perform for five years, election results speak volumes if you want to know how the people feel. Taking political advantage when an innocent woman's life was threatened? Such statement by our politicians is evil. It goes against the teachings of the founder of Pakistan, our beloved Quaid. It goes against the teaching of our religion Islam, which calls for justice for all. Politicians should be role models of honesty and compassion, not dishonesty and brutality. If law breakers are law makers then this is what you get. Pathetic scenes. Such hooligans brought first Martial Law of Ayub Khan. Apparently, if anyone speaks harsh facts about a guy named 'Niazi', he/she would be attacking on Mr. Imran Khan Niazi who is obviously only one left of Niaiz clan. There is no need to remind that PTI has most logical supporters than anyone else. Even though, logic takes dumps in this case. Well you could criticize an action by its merit but you have no right to lament the whole tribe which is nothing to do with your personal vendetta. . Ms. Marri is a seasoned parliamentarian, she shouldn't get personal whereby objecting the government. . These are the so-called enlightened individuals representing the nation. Need I say more. Although she claimed that she was referring to General Niazi, the innuendo is unmistakable. The immaturity of our political parties is making the country and the state weaker every single day. This seems to be a recurring theme in Pakistan. Did Mari forget the role that Bhutto played in formation of Bangladesh? The only way to calm down or deflate Zardari & NS types is to fast recover the super loot still under their control, few days of lock up give them an an opportunity to pretend their lock up is politics & not crime. This is not a learned 'gentleman's' club, rather it's a wrestling pit! Really very mature behavior by all our so called 'honorable' parliamentarians. I think this incident of TLP has been handled with brilliance by the government. By signing on 4 conditions that dont mean anything. And is open to any result in future. Now the action has started against TLP Khadim Rizvi and 1100 people arrested in last 2 days. The best part is TLP disowned those who destroyed properties so no chance for people to get out of jail. The opposition is right here! Shazia Marri rightly pointed out that it was an act of surrender on the part of the government in front of the protesters, who used violence and destroyed public property to get their demands met. The State was forced to sign an agreement with the protesters in the same manner PML-N signed agreement in its tenure. This is a dangerous trend and must be avoided and the Govt. should maintain writ of the State at all costs. What about Z A Bhutto who refused to cede power to the party who won election? MNAs not acting with dignity is the reason the house has little of it in public eye. Such behavior is highly unbecoming of a parliamentarian and if others desire to bring some respect to the house, such behavior should result in ineligibility from becoming a member for some period of time. 3 years at least. I am not a PPP man , but she is Right as this is a case of future precedence. Well done IK. Dont open new fronts, just pay attention to country's economy and those elements who pushed the country in this situation. PNLN leader Shabaz Sharif chearing a meeting in parliament. I thought he is in NAB custody! @asgher, I wish I could be as optimistic or innocent as you. Alas age kills all of that. You must be fan of either PPP or PML-N, whatever it is you must understand PTI Imran Khan just took over government few weeks ago and you people already started criticizing him, you must give him at least 6 months to 1 Year before you judge his performance, he inherited government with empty treasury. On the other hand PPP and PML-N each ran government at least 10 years and what have we gained, the results are in front of you. Hope this helps. One Niazi surrendered in 1971 and another in 2018. Sometimes truth hurts. IF Nawaz or any of the PPP lot had a tenth of the love that Imran has for Pakistan, the country would have been in a better place today. PMLN and PPP are the opposition today. And this is what the oppositions do. This opposition in Pakistan is even worse because many of leaders' kids and assets are based in foreign lands. It would be better for PTI to ignore such people and continue. As for Shazia Mari, many are still waiting for an explanation of Faryal Talpur and Qaim Ali Shah's pics with Uzair Baloch. Anything? The parliamentarian and most of the these are an economical burden on our country. They draw almost 150000 rupees monthly and what do the do for Pakistan? Nothing. May be there is no need to have so many in both houses. More strict action needed against corrupt families and their cronies. Since none o the activities involved law making, these folks should not be paid their wages. PTI agreement is actually the best among the previous ones. See who is talking about the economy? The one's that really know how to take slices of it! Noon, you guys want to eat the cake and have it too? Shazia Marri should have known better not to attack Niazi Clan.There are several Niazis who have given their life for this Country. She has offended all Niazi clan .She should apologize publicly. Ms Shazia Marri while ridiculing late Gen. AAKNiazi must also realize that Maj. Generals Javed Sultan and Zia Ullah Khan both are Niazi, both were killed while serving on our western border. Before getting into generalities, I would like to know what sacrifices Marris have made for Pakistan. PTI in our citizens opinion have played their part to control these ignorant people thus has saved lives a properties. Government task is to set an example by recovering loss of damages from the apprehended fools. Ms Shazia Marri does not have to remind us of late Gen, AAKNiazi, we Niazis carry that stigma of his surrender. Does she know those highest-ranking military officers, Maj .General Javed Sultan, Maj.General Zia Ullah Khan both Niazi while serving were killed at Pak-Afghan border. It’s the same old Pakistan. Nothing has changed. What a low class our leaders are, these people are suppose to be representing Pakistan.This PPP MNA representing PPP has no business making such remarks. She must show leadership and class if she wants to call out the government. Can someone remind this lady that her own party's performance the last time is considered the worst in the history of Pakistan. As for Shahbaz Sharif, I'm shocked he is willing to show his face in public. If the parliament is being used to show they have no respect for the place of constitutional discussions. It seems like the parliamentary individuals don’t understand the sanctity’s of the forum&it’s purpose of being called to session. In democracy its the patience&virtues of parliamentarians that are tested at many occasions.In fact it’s tested every now&then, nevertheless showing lack of discipline by a parliamentarian or some of the parliamentarians is kind of complete disregard of the Democratic process. Pakistan lost its East Wing not because of General Niazi, neither Pakistan lost its war to India due to its surrendering Army under the then General Niazi who surrendered to the Indian Army.The fact is the international conspiracies and local South Asian conspiracy against Pakistan came to successful end due to our own leaders in the field of politics from both East and West Wing of Pakistan. The hate that was demonstrated towards each other is still visible in the parliament. It is really surprising to hear these comments from someone who rose through the ranks to become a General going through Staff College and War College and still saying this? Extremely regrettable Shazia Marri attitude, using wrong example, about Niazi, I should remind H'ble Lady member Shazia Marri that situation created by your PPP Chairman ZA Bhutto, I was die heart PPP member and later 1971 I regretted whole my life why I have voted PPP, and this separation happened due to Mr Bhutto. Now Shazi giving Army and reminding them incident, I am requesting to COAS to take a serious action against Shazia under Army act. This Lady putting petrol on fire. The opposition parties are doing opposition for the sake of opposition. The opposition parties should come out with a a long term strategic plan to develop a tolerant and compassionate society. My personal view is Section 295-C should be repealed in way that it is less susceptible to abuse. PTI has very intelligently blunted the attack. Now they are going after the miscreants meanwhile process of accountability will continue. Once investment starts coming in on account of security and credibility Pakistan will resurface inshaAllah. Indian and Iranian efforts to challenge Gwadar are hampered due to US actions against Iran. If a stable Afghan government comes in place, doors will open to central asia and europe too. N, PL had failed miserably and are trying to divert attention even by scuffle. Gov handling situatiion very well. @AXH, Shazia Marri is a trouble maker. She has no idea what to talk and how to address national issues. She is all emotions and no substance. @Hani_Layyah, marri is a bygone era dynastic clan in politics. they did nothing for their tribes and province. @asgher, agree. but the ECL entry, while symbolic and subject to overturn, sent the wrong message. some label it as a u-turn. overall, agree with your synopsis. the tactical and strategic objectives were handled separately. well done by the government. These politicians should be ashamed of themselves to exhibit this wild behavior. They are supposed to be an example for the citizens! Forfeit their one month salaries. We hope Shazia Mari Saheba will ably convince Sindh government not to surrender before MMA for their million march to ridicule apex court verdict. Three days after the Prime Minister's speech, the convoluted deal with TLP, no doubt, came as a big surprise and disappointment. Naturally the parliamentarians have a right to criticise and express their views, and propose better alternatives. But the way Shazia Marri and Syed Rafiullah and others behaved did not establish any decent and dignified standards of parliamentary behaviour, only childish, frivolous and unserious attitude. Their language and behaviour was designed to provoke the opponents and certainly not constructive criticism to address the problem. They did this to satisfy their own ego and create more problems for the country. What effect it will have on the masses of the country? Can such people be trusted to solve the economic and numerous other escalating problems the country is facing? It seems to me matters are rarely settled in Pakistan. Even after the Supreme Court has made a reasonably fair judgement about Asia, a segment of the population refuses to accept it. What is this non-sense? This is the final judgement. The Govt has no reason to make any change in what the Supreme Court says. If it does then the Supreme Court is not Supreme. What about Zulfiqar Ali Bhutto who broke Pakistan? Has Shazia Murree this forgotten? @Habib A Zuberi, - why are you surprised? Are you not a product of Pakistan? Why some of these guys who go overseas start behaving like they know nothing about Pakistan??? @enam, - stay on this issue please. What Bhutto has to do with it? so far, no maturity shown by the opposition. only criticizing the Govt. They should now understands that no matter how much hue and cry they make, people in the country won't heed any attention to them. Because they are proven looters and absconders. Good exercise for these over wieght people. Bring an end to corruption as soon as possible , it will be good for everyone . did not see any protesters on the street chanting and shouting to FREE Asia Bibi...sorry state of affairs!!! !